This week we wrote Friendship Cinquains. First of all we interviewed a friend in class and asked them these questions. 2. What are some adjectives that describe you? 3. What are some activities that you enjoy? 4. What do you think makes you a good friend to others? 5. Do you have a nickname? We used the answers to help us to write our poems. Have a look and let us know what you think of them! Every January we celebrate Scottish Poetry. This year Primary 3 learned the poem ‘A Dug, A Dug’ by Bill Keys. We performed it with a partner and we’ve chosen three recitals to share with you on here. It was hard to choose which ones to put on! Let us know what you think of them. Next is the recital by Caitlin and Katie. Finally, here’s one by Ross and Stuart. Have a look! What do you think? Today in class we made Friendship Cinquains. A cinquain is a five lined poem that follows a pattern. First of all we interviewed a friend to find out how they would describe themselves. We also asked them what their hobbies were and what makes them a good friend. We used the information to help us write the poems. We even asked them if they had a nickname to add to the last line of the poem! Last week we watched a video about how to write an ‘If Only…’ poem and we decided to try to write our own one with the same title. We chose whether we wanted to work with a partner or work on our own, and we brainstormed our ‘if only….’ ideas. We made a PowerPoint slide to illustrate each idea. We also recorded our verses and then put them all together in Windows Movie Maker to make one big ‘If Only….’ class poem. We’ve got some more ideas about more ‘If Only…..’ poems – but meanwhile have a look/listen below at our first attempt and please leave a comment to let us know what you think. If Only from mvass on Vimeo. This is our last week at school before our Christmas break. 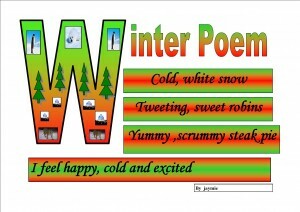 We wrote some Winter Poems to help decorate our school hall. First, we thought of three nouns to do with Winter – one thing that you see, one thing that you hear and one thing that you smell. We then wrote two adjectives to describe each noun. For the last line of the poem we wrote about how all these things made us feel. 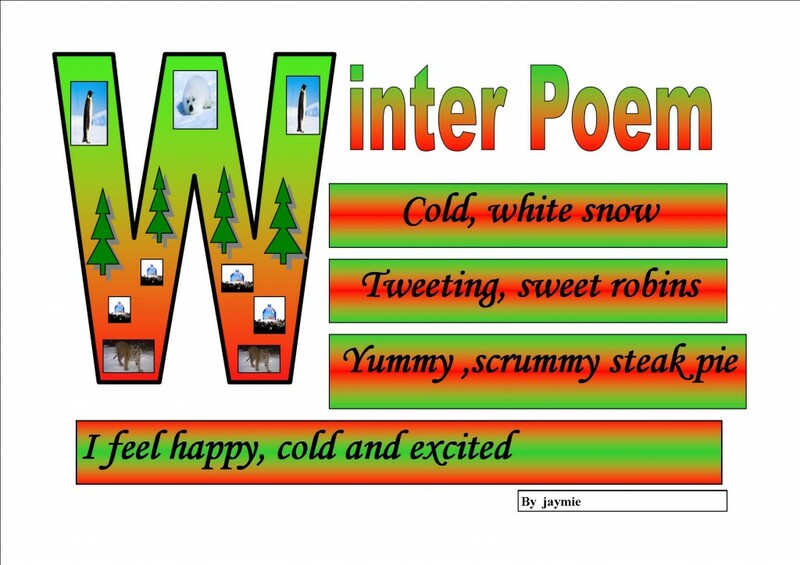 Finally, we decorated the big letter ‘W’ with some winter clipart.